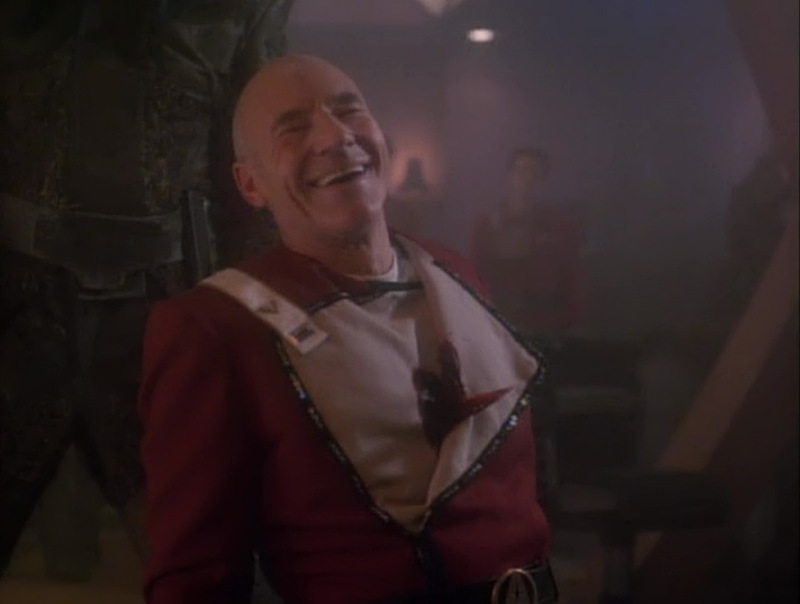 This is both a great Picard episode and a great Q episode. The "road not travelled" story pops up in more places than science fiction (see It's a Wonderful Life), so the way they managed to have a novel twist on both that concept and avoid the pitfalls of a time travel yarn are commendable in and of themselves. Working in the one good scene for a crappy season 2 episode is just icing on the cake. Ah, Broccoli...I mean Barclay. We have the fun science fiction exploration of how such an immersive recreational technology would impact ordinary people, and we get introduced to a wonderful new character. Meeting a man who is not a superhero in a world of superheroes is a lovely glimpse into life in the Federation and makes him instantly sympathetic. 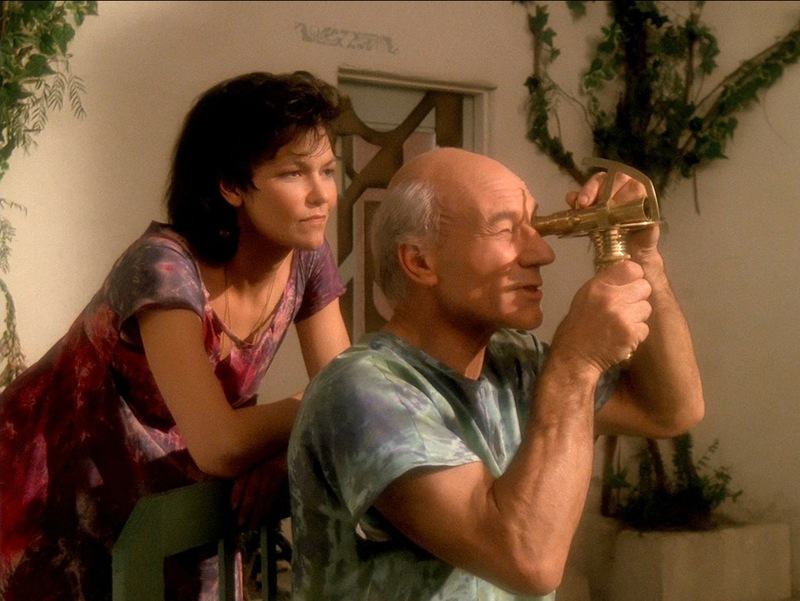 We do like Captain Picard here at Treknobabble, don't we? Exploring Picard living a completely different life is certainly dramatic gold, but what really makes this episode is that for a people I know are ficticious from almost the beginning, have never seen before or will again, I am completely invested in this people by the end of the episode. The quiet poignancy of the last scene alone secures a high rank for this one. Speaking of slice of life stories, exploring a big dramatic Cardassian story from the eyes of characters who aren't in on the meetings was inspired. Working in the well known character of Nurse Ogawa and reintroducing and expanding Ensign Sito were elegant continuity nods. Add to that the fact that Shannon Fill was immediately knocked it out of the park with her portrayal of a bright, talented, if not a little insecure officer, and you get a truly awesome outing, and a highlight of the last season. We need someone under 5 feet tall. You're it. We here at the Gates McFadden Appreciation Society (M. Weflen - President, K. Curran - Recording Secretary) take our duties very seriously. Everything the woman does is a master class in stage acting and how the smallest choices combine to make a character and performance flat out riveting. The sci-fi idea is a nice reintroduction of Where No One Has Gone Before and the Traveler and the mystery itself is creepy and exquisitely developed. The universe is a spheroid region 705 meters in diameter, whose one occupant is an awesome actress. Consarn it, Beverly, why are our uniforms different colors? 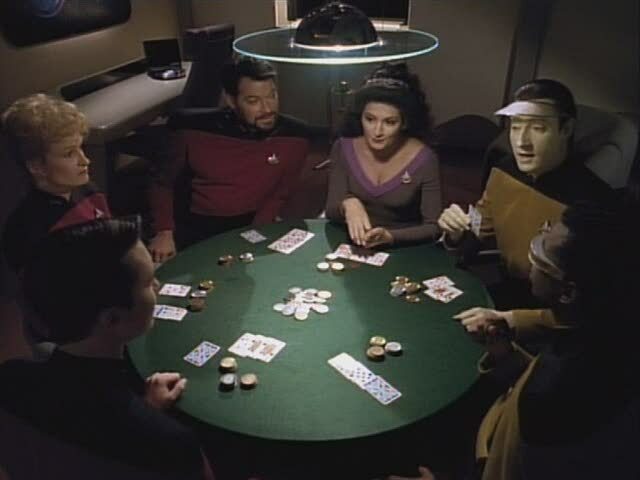 Like Lower Decks, focusing the episode on well-developed other people, the result is a compelling story. You buy Yale's unbridled enthusiasm and Durken's cautious reserve. Add to it an intelligent and practical application of the Prime Directive and its principals, you get a very Star Trek story told in a very interesting way. His renal organ was THIS big! Frankly, I'm surprised this came in 4th, and by such a margin. I rated this one at the top of my list. I think it has literally everything. The time travel story is well executed, save for one small flaw. The emotional core of the story is beyond engrossing, and the skillful revival of the Q trial manages to not just give the episode dramatic momentum, but tie a bow around the entire series. For as much ambition as the episode had, I think it delivers in spades. Still, 4th place is nothing to sneeze at, and the medals winners are nothing to be ashamed of losing to Yesterday's Enterprise in third place. 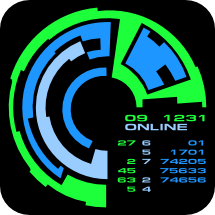 How many years have we been doing this show again? This might be the best hour of television Ron Moore ever had his hand in, and that's up against some stiff competition. We get a continuity inspired, but not overburdened, story that reimagines the Klingon peace process and introduces another ship in the Enterprise's lineage. Like so many episodes on this list, the guest characters were incredibly well acted and made me care about them immediately. 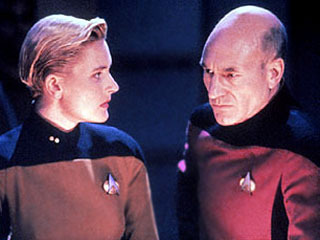 Star guest turns by Denise Crosby and Whoopi Goldberg round out a jam-packed hour of television that leaves you wishing it were a two-parter. 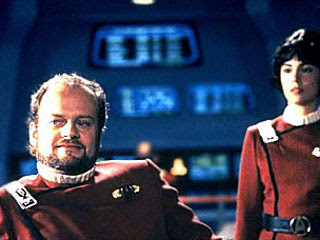 You've exceeded your hair gel ration again, Lieutenant. Looking over the top twenty, and particularly the top ten, some trends begin to emerge. I think the biggest is that the episodes we consider the best are the ones that use both novel science fiction and strong character elements to tell a story, not sacrificing one for the other. 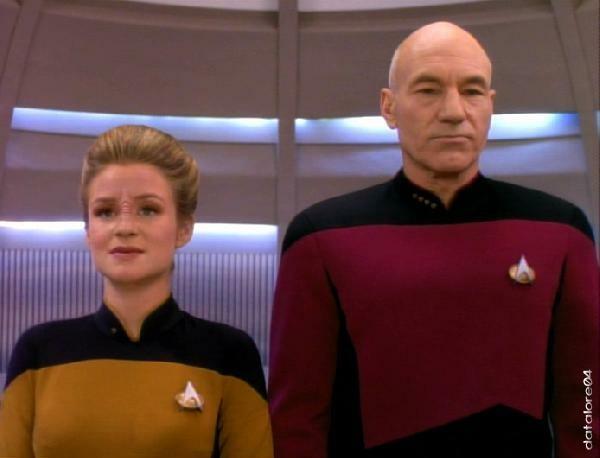 The episodes explore and make me care about the nature of the sci-fi phenomenon by making it meaningfully impact the characters I know and like. Doctor Crusher's increasing ill-ease in each iteration of the loop makes me care about the problem as more than just another weird thing in space the Enterprise encounters. 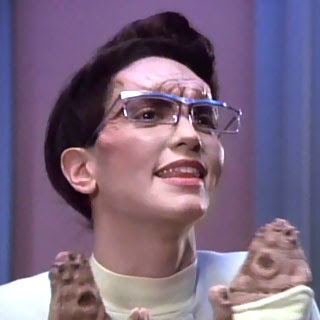 Rounding out the episode is some simply top-notch directing by Jonathan Frakes who manages to stage the same one act play four times without it getting stale. Lastly, the episode almost certainly wins the award for most high-impact teaser with the technically and dramatically stunning destruction of the Enterprise. The Bozeman is powered entirely by my sense of self-satisfaction. And picking up the award for best ending of an episode is Best of Both Worlds, Part I. 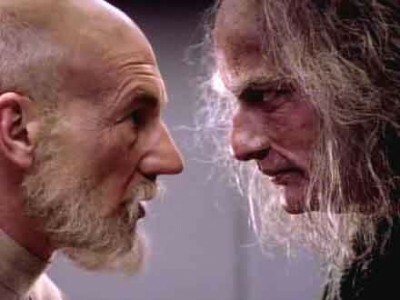 Again, the science fiction and dramatic tension of the Borg is not merely taken for granted by the story; it uses the relationships of the crew to make it manifest. The episode is not just an action story. It's an action story that matters to me because of the way it impacts the characters I care about. The result is an episode who even before we get to "Mr. Worf.........fire," has had us on the edge of our seats for an hour. 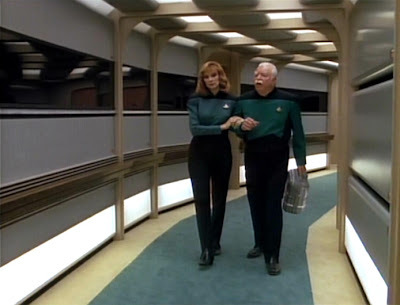 The way in which the episode managed to leave us there for an entire summer is also to its credit and I don't think it's off the wall to suggest it started, or at least nursed, a trend in and out of Star Trek to leave season finales on a cliffhanger. So she was like "I suggest you make way for someone who can." And I was like "Oh no you DIDN'T!" As always, thoughts, opinions, comments, critiques, rants, soliloquies, asides, harangues, judgments, observations, criticisms, and remarks are welcome in the comments. Very interesting. I agree with most of the above, although there are many episodes I really like and which seem not to have been rated high enough to be on this list - like "The Measure of a Man" or "The Frame of Mind". Frame of Mind would definitely be in my next 20. Love that show. This list is basically the top 10%, and I can't imagine any of these lower than they are. The Measure of a Man is also an early highlight. It's probably in the top quartile for me. A bit overly talky. I think I have to agree for the most part with the list. Are you going to do a bottom 10? Here's my personal top 10, btw. As you can see, most of them made the list, just some different ordering. I think these ten shows are basically flawless.